Where I live, Winter is a tough time for many of us. It is cold, damp and dark. We see the sun infrequently - sometimes due to the afternoon sunsets (can you say 4:15??) and sometimes due to the thick blankets of clouds covering the world overhead. Frequently, I think, by the time spring hits, we are amnesia patients forgetting what blue sky looks like. Many of us (I will raise my hand to join this throng), see winter as an enemy to be endured - through hibernation, tough grit, or grudging surrender. But is there an alliance to be forged with this unrelenting season? Is there a gift to be found in winter? There is beautiful symbolism that comes from the Chinese culture in the form of a picture. 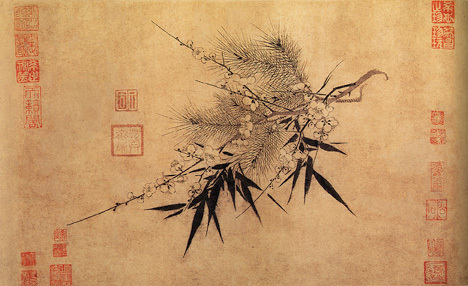 The picture is of a pine tree, bamboo, and a plum flower. This trifecta called "The Three Friends of Winter". Each member of the trio chosen for their vitality in the midst of what seems an unfriendly season. Most of us would recognize the pine as being a picture of endurance and life in the thick of the harshest circumstances. Its evergreen "leaves" speak life when all other cousin-trees have grown barren and sleepy. (Is it any wonder we choose pines for our Christmas trees??) Its strong roots reach far down in the earth to withstand the howling winds, rain, sleet and heavy snow of winter. It reminds us to stand firm in harsh seasons. The strength of bamboo, on the other hand, comes from its flexibility in the face of winds and storms. Its footing, like the pine's, never moves, but it bends and twists with the prevailing weather. So often winter brings unexpected cold, snow, storms, power outages and emergencies...in short, real life! However, bamboo helps us remember to bend - not break - as we face our own natural disasters. Though not native to Seattle (that I know of), I am told the last of the three friends of winter, is a surprise in the nucleus of the harsh environment. Plum blossoms arrive in the middle of winter with a riot of petal explosions that fill the tree. Perhaps they are not the most beautiful flower, but you can be sure they are one of the most noticed when the rest of the landscape is seemingly dead. In the middle of frigid cold, these blossoms do not hunker down, but open themselves to the very elements that threaten them. To open our hearts in the midst of adversity is their lesson. May we all face winter knowing we have Three Friends to guide us. May we stand firm, be flexible and open our hearts even as the elements fight against us.